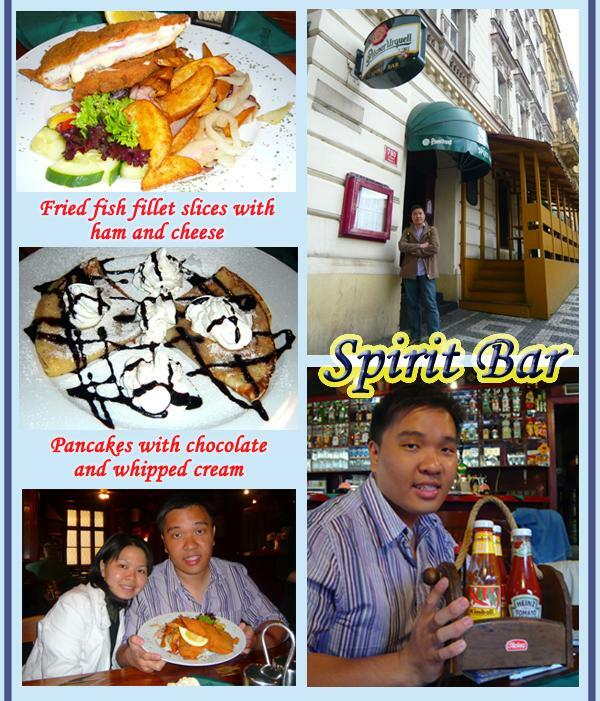 This restaurant comes highly recommended by Hostel One Prague staff by its reasonable-priced food and proximity. However when we heard the name of the restaurant – Spirit Bar, its only 11am – too early for some alcoholic spirit at a bar? Surprisingly, the Spirit Bar is very very near (just 3 minutes downhill walk from our hostel) and they serve lunch too (instead of just alcohol). English Menu (while the service staff were not able to converse in English, we were able to choose our food easily – thanks to the menu). We ordered a 150 g fried fish fillet slices with ham and cheese for just 90 CZK and pancakes with chocolate and whipped cream for just 55 CZK. Chili sauce available (no need to pay extra or request for it). First time we had chili sauce served by a restaurant in Europe! The fillet looks delicious! What about the drinks? .-= kelvin´s last blog ..Daily happenings – I was nearly killed by the doctor once more. =-. Hi Kelvin, I’ve forgotten what drinks did we order. But from the e-menu available online for Spirit Bar, a 0.1L apple juice cost around CZ10 and a 0.33L coke cost CZ27. Taking the time and actual effort to create a really good article… but what can I say… I put things off a lot and never manage to get nearly anything done.